For this campaign, general discussion and recommendations and photometry are covered in this forum thread, and spectroscopy is covered in the Spectroscopy forum thread "February 2018 b Per observing campaign Spectroscopy". In AAVSO Alert Notice 610 on b Per, the alternate name SAO 29531 is given. It should be SAO 24531. The online version of the Alert Notice has been corrected. Thanks to Jason Rivet for letting us know. Just only a request about spectroscopy (at this moment the dedicated forum is closed). I could take spectra with a Baader slit spectrograph, able to give resolutions of 800 (covering almost all visible spectrum) and 5000 (covering a window of 700 A wide), but the friends of Aras Spectroscopy could take spectra with échelle-spectrographs and resolutions of 10.000 or more. More details about the requirements of resolution, window coverage or most important bands, etc... would be apreciated. You said regarding spectroscopy that "at this moment the dedicated forum is closed". What do you mean? Are you not able to post there? Remember you need to be logged in to be able to post. Please let me know what the problem is so I can fix it if it is at our end. sorry, the forum is active, but the link in your previous post seems broken: when you click it, a message says "page not found". I will post again the same message about spectroscopy in the right forum. Thanks for letting me know. I fixed the link to the Spectroscopy forum thread from my initial post above, so that now works. My apologies for the inconvenience! 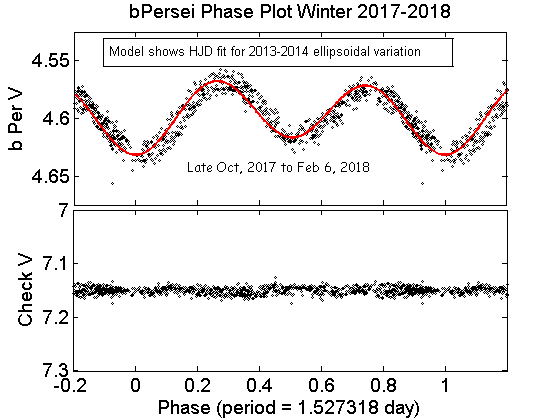 Welcome b Persei observers for the upcoming eclipse of the inner close-orbiting A-B pair by the third star of the system scheduled transit about Feb. 12, 2018. The transit duration lasts between 2 and 3 days as the third star alternately blocks and unblocks each of the inner two stars - possibly more than one time during the transit. Because the out of eclipse light curve shows about an ellipsoidal variation of about 0.06 magnitude (V) observers need to record several long runs out of eclipse in order to establish a good comparison baseline. We're pleased to see some data being submitted to the AAVSO data base, especially by new observers! I am pleased to see the photometry results come in to the AAVSO database. It's also good to see new observers contributing. Let's please remember that when weather permits, try to get long runs, both out of eclipse and in eclipse. The eclipse is expected to be centered on Feb. 12 UT with a duration of 2 to three days, so there could be initial contacts as early as Saturday, Feb. 10 UT. The long runs are needed to match the photometry zero points with the out of eclipse curves, especially since not all of us are transforming the data to Johnson V.
I have been obtaining data since late October, 2017 to update the ellipsoidal variation. The curve is attached. The model fit is the 2013-2014 model. Soon to be updated. 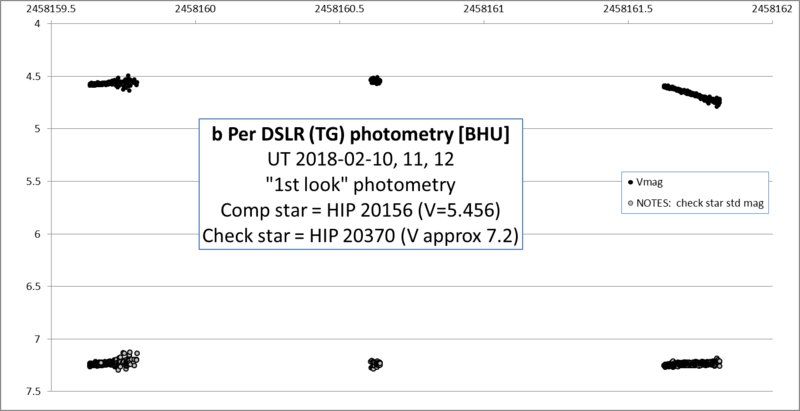 Is DSLR photometry useful? If so, do you want RGB Raw data reported? after a week with the flu, yesterday I observed b Per from the evening until the star was too low in the sky to continue the photometry. I'm not sure but at the beginning the star seemed to be a bit fainter than expected. Maybe a first contact? Today and tomorrow will be the most exciting days. But forecast in my place is bad, so I'm afraid I will loose the entire eclipse. Sorry! Very bad weather in France too, we have that situation for more than two months now ! I do not remember such disaster for astronomy, effect of the global warming ? I only got one hole between clouds a week ago within those months, and got a good series of the b Per oscillation. Regretfully the prospects for the eclipse itself are bleak, will try if some hole happens ! I echourage Europeans to try for any clearing you get as the skies are totally blocked in eastern USA. We'll do the best we can. And suddenly the clouds opened and with the exception of occasional bands of clouds that are quickly passing thru the field, the air is as clear as it hasn't been for weeks....go figure. Waiting for tonight clear sky .. I am waiting for the area of clear sky over nothern Germany, which Bikeman uses. I hope that it will be here in one hour. I observe in north-west corner of Poland. Observations in my place should be possible up to 1 UT (height of b Per over horizon > 30 degs). I got a short clearing about 18:45 UT for half an hour, got about 30 clean images. 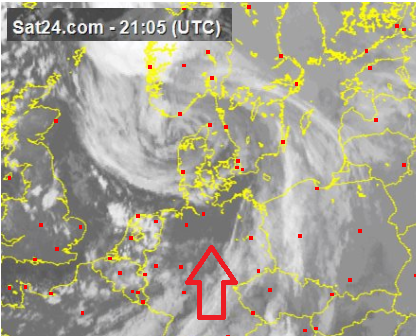 Another clearing should occurs about mid-night following the satellites images. My first 10 images have a high scatter due to cloud residues, not ok, next 20 are ok, raw scatter very low. The difference from feb first night is minimal; a couple of mmg. This is provisional analysis as I have no right flat already available, will do that later. Two results rtf tables attached, one from feb first, next for tonight. I did some prelim. reduction for data taken around 21:30 UT, and that is still consistent with Roger's. Conditions begin to deteriorate here, so I'll have to stop soon. Looks like I'm done for this night. The last series that I processed preliminarily was from ca 2018-02-12-00:01 UT, and that still showed b Per at ca 4.57 mag in TricolorGreen with V Zeropoint wrt "55" comp star, which should then be roughly 4.59 in V . I haven't compared that to where b Per should be wrt the out-of-eclipse variation, but at least other observers should be encouraged that they haven't missed anything dramatic yet :-). I'll do the rest of the reduction tomorrow. New clearing and observation about 0:00 UTC, no significant change. I continued observations of b Per from 22 to 1 UT with some little breaks due to clouds. I didn't found a significant brightness changes - it's an estimation only on measurements of RAWs (30sec exposured; 200mm F/4 lens on a drive). Hello observers, The attempts to find holes in the clouds are appreciated. I hear no evidence of entering eclipse as of last night, one day before the predicted center of eclipse expected JD 2458162 (Feb. 12 1200UT. +- 1 d. We'll continue to look for starry skies the next several nights. I expect the initial contacts to be partial eclipses that last a few hours, but the central ecllipse should be quite deep. I'm looking forward to any data submitted to AAVSO where we can see the plots. It was clear last night in Phoenix area, and my long run of DSLR photometry shows pretty compelling evidence of the start of the eclipse: see attached graph, which shows the last three nights. I'll submit the data to WebObs after I clean it up (eliminate images affected by clouds, and average images into groups to reduce scatter), but thought you all would like to know. Yes, the drop is clear and steady. I'm making photos directly to a laptop and I verify images in Iris. En mi localidad desde España, estaba completamente despejado y transparente a las 19nhoras 30' y he empezado a tomar imágenes; pero a las 20 horas empiezan a aparecer nuber altas; espero que no vaya a más. On UT 18:30 I got a first series at 4.74 instead 4.61 yesterday, part of it is the oscillation but it's clear we have an eclipse, the begining or the end ? Conditions are not great here in Northern Germany, but I'm also taking data and I measure about 4.7 from very preliminary reduction at 18:40 UT . Lots of haze here. By comparison with the previous primary eclipse LC, this would probably mean we are still at the beginning of the eclipse. Oh well, there is quite a bit of tension between individual results from last night, even allowing for systematic (constant over time) offsets between observers. I think with a star this bright, the most common source for problems could be pixel saturation, so it might not be a bad idea to check whether any pixels in the b Per (and comp stars) images are saturated. Note that in low ISO settings, saturation can happen at lower ADU count levels than 2^(bit resolution of your camera), e.g. below ca 16.000 for a DSLR with 14 bit digitizer. Bikeman has a good point, so it is the responsibility of each observer to assure that the data are not possibly saturated. The results from previous eclipses of b Persei showed similar variations between obsevers. These were usually matched by matching the out-of-eclipse data from the same observer to match a "standard" level for the out-of-eclipse light curve. I have been generating a current out-of-eclipse light curve and fitted this light curve with a 2 harmonic Fourier sequence. The data for my light curve covers bPer data from late Obtober 2017 until Feb. 5, 2018. A graph of the phase plot with Fourier fit is attached here. This technique has brought most observers' data into good agreement for the eclipses. However, it is important that all observers include several runs of out-of-eclipse data in order to match the light curve and that we all use the same comparison star. Of course please check if data may be saturated and flag with comments in the comments field. Good Observing. I may be lucky with a break in clouds tonight! bad weather continues disturbing but at least I catched some images between clouds. At this moment (February 13th, 20 UT), b Per continues in deep eclipse (mag. 4.71 more or less during the last two hours). Definitively, I will remember this campaign by the lack of clear skies. Just reported my yesterday observations, the sky was clear for the full night, the only in more than two months here ! Regretfully tonight it's back to full blocked, no way... I have a long series from feb 1st and observation from feb 11st to reprocess with the good flat, will report it by tomorrow. This time I observed using a large field of view (9.3 deg. ), a large "ensemble" for comparison, extinction correction, VSF color correction and secondary correction. The "55" results are reported under the check position, you could see it's in general very near 5.456. The shape of that ingress is surprising but I think it's just the combination of the elliptical oscillation and a relatively partial eclipse ? Don, if the format of my report (ensemble) is not ok let me know, I will change it. Miraculously, the weather suddenly cleared in Western N. Carolina 2 hrs before dusk and I got started recording at dusk. b Per V is about 4.72 at 2400 UT on Feb. 12. We are at least one day into the eclipse. I compared my DSLR measurements (orange) of the 12th to Roger's (blue) and found them in good agreement if you shift my TG values by an offset of 0.0375 to Roger's V values (Roger's values have a much smaller error than mine but smoothed trends look consistent.) Roger's data also seems consistent with PEP measurements that night. None of this is consistent with a relatively steep drop observersed by another observer (yellow) around JD 2458162.298, so yes, reconciling different observations will be a challenge. In spite of terrible weather in most places, the large international cadre of observers has obtained a significant amount of overlapping data. Many thanks to all observers! However, we still miss the Asian and Pacific observers. The eclipse is probably about half done, but we don't know the full story from the March 2016 eclipse due to similar gaps. We should continue to observe when possible during the next several days. Notice, that we haven't seen the sustended time deep eclipse that was seen in March 2016. One possibility is that it may have been in one of the gaps in coverage. The data from last night (JD 2458163) shows a peak between possible deeper dips. One major upgrade in my processing of everyone's data is that I plan to subtract the ellipsoidal curve from the data so that we can distinguish eclipse dips from the ellipsoidal variation. This may add to confusion in the primary eclipse since the partial blockage of the A class star by the fainter C star will decrease the amount of ellipsoidal variation. I assume that most of the ellipsoidal variation is contributed by the brighter and assumed large A type star of the inner pair consisting of and A type and an F type. (Hill, 1976). I invite comments. This might sound far-fetched, but if all else fails, have you considered looking into the data of all-sky monitoring networks? b Per is sure bright enough to register on those cameras, and could be just faint enough not to saturate with a bit of luck. While this will certainly not yield high quality photometry, it might be sufficient to rule out or confirm whether this is a deep eclipse or not, given the high cadence of the image aquisition. The all sky network sounds it is worth a shot, even though a long one. I am unfamiliar with it and am pretty busy in the next couple of weeks processing downloaded data from AAVSO. Would you be willing to look into the all sky network? I guess the first step would be to search in the literature to see if this has been tried before (I would think so) and to see just how crazy this idea is. I can try that over the next couple of days. Today same situation: clouds, some clear holes between clouds... but at this moment b Per is in 4.63m. So it seems the main eclipse is over... for the moment. Let's go if we observe another eclipse... The party is not still finish. Last night (13 Feb) good sky and so 'also tonight. Unfortunately I can not observe after 21h because the star ends up under the roofs of the houses. Tonight I had a first night without an evening observations of b Per from 5th of February. Clouds (huge fog ?) just have stopped 20km from polish border. But northern Germany were without clouds (Bikeman could observe!). Sorry for you Richard. Indeed, I'm still taking frames. There's quite a bit of haze, but maybe that won't hurt photometry too much. It seems you missed the end of the eclipse, at least according to prelim. reduction of my last few frames, b Per is back to the pre-eclipse variation levels (and at the brighter end of it). Anyway, as Don wrote earlier, we need to take data in- and out-of-eclipse anyway, so don't let this stop anyone from taking data. Anyway I understand there could be additional dips from the eclipse? Hi all, Thanks to everyone who has braved the clouds, shot through thin clouds, shot through holes in the clouds to get coverage of the eclipse light curves. Although the preliminary light curve looks like the eclipse is finished, there still is a slight possibility there may be one more possible partial eclipse. We have never observed a complete light curve due to the gaps from Pacific and Asian night times, so we are not sure of the total duration of the possible partial eclipses with the close-orbiting inner stars. So, Please observe for at least one more night (JD 2458165 = night of Thursday-Friday Feb 15-16 UT) for those who are able to see the stars. Also, please get a several hour run out of eclipse if you have not submitted any runs pre-eclipse. Thanks for letting us participate in this interesting project! In the meantime I'm woking thru the backlog of processing ca 4000 frames taken during this b Per campaign. I need to make this more automated, I usually do photometry at a much lower cadence. Dear observers, Again many thanks for the coverage of the last week's transit in the b Persei system. I am making slow progress in processing and collating the data (mostly revising code for display, averaging data for smoothing some of the fast cadences, calculating offsets etc. I will post results at this forum, so please keep your subscriptions. Meanwhile if you have any observations that haven't been submitted, please submit them at your earliest convenience and let me know through the forum of your new submissions. The next eclipse will be centered on Nov. 20, 2018, JD 2458443, only 9 months from today based on the photometrically-determined 704 +- 1 day orbital cycle from the December 20, 2016 eclipse. The primary and secondary eclipses of b Persei are not symmetrical due to the eccentricity of the third star's orbit. The Nov. 20 event week is very close to the 2018 AAVSO Fall meeting (Nov.15-17) at Lowell Observatory. I just reported my results from the night from Feb 11th to Feb 12th. The data has quite a bit of scatter, the seeing was not that good that night plus I should have de-focused more, but I seem to have covered a period that hasn't been reported by others yet, and the data should be good enough to rule out the beginning of the eclipse for most of this timespan. I hope to report some yet missing out of eclipse data tomorrow.